Matthew Perkins was born in Manes, MO, November 23, 1911. He served in the Army during WW2 and in 1958 opened Perkins Pancake House in the Cincinnati suburb of Silverton, with his brother, Ivan. Their pancake recipe? 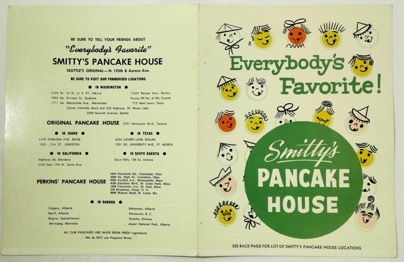 It was one which Matthew had purchased the rights from William Smith, owner of Smitty’s Pancake House, in Seattle. It would be hard to say if the original Perkins Restaurant was opened by the brothers in Silverton, Ohio in 1958 or by William “Smitty” Smith in Seattle, Washington in 1957. 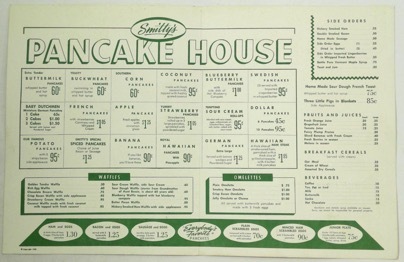 Both chains operated successfully throughout the 1960s and 1970s divided primarily by the map with Perkins Pancake House in the East and Smitty’s in the West. Perkins Pancake House was no ordinary pancake house, as one glance at their old menu would reveal. Guests could choose from over two dozen different pancakes and waffles, to satisfy any craving. Whether traditional buttermilk batter pancakes, potato pancakes, or waffles made with butter pecan or coconut, the restaurant had something for everyone. The Perkins brothers added sandwiches to their menu in the 1960s and continued to expand the restaurant, offering franchise opportunities. In 1967, Wyman Nelson, a franchise in Minneapolis, Minnesota, extended service in his restaurants to 24/7 and added a dinner menu. To reflect this change he renamed his restaurants Perkins “Cake & Steak” Inc. Over the following decade, Nelson gradually acquired both the Perkins and Smitty’s chains, and by 1978 he had consolidated his efforts and purchased the Perkins trademark outright. The company was then acquired by Holiday Corp., the parent company of Holiday Inns, in 1979 and the mid-1980s, Donald Smith, one of Holiday’s board of directors, purchased the chain and subsequently transformed the restaurants completely. Not only did Perkins get a cosmetic makeover, undergoing significant in-store renovations, but the menu saw a complete overhaul as well, shifting the emphasis to breakfast omelets over pancakes and adding cheese melts and specialty salads to its lunch menu. An in-store bakery was added in 1986, and the change stuck: the restaurant chain became known as Perkins Restaurant & Bakery. The revamp was a hit; by the 1990s, Perkins’ revenue had tripled. In 1988, the first international restaurant opened in Ontario, Canada. 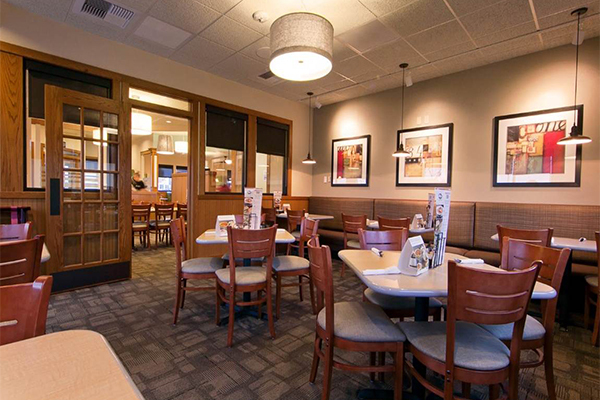 Expansion continued, and today Perkins has over 450 restaurants throughout the US and Canada. 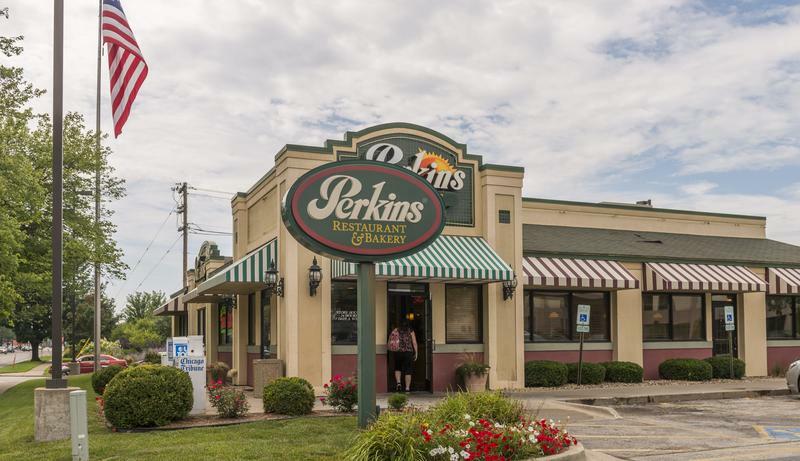 Perkins celebrated its 60th birthday in 2018 and rolled out a new menu. They added breakfast and dinner skillets as well as five new burgers. Perhaps the biggest secret to their success is this: Perkins has always meant quality. They have always been open to change and listening to what their customers want, revamping their menus and offering unique and fresh bakery items. What Is It Like To Work At Perkins Restaurant? Name Origin: Named after the founders. Please use this link to find Perkins locations so that you can call your local store to inquire. Do Kids Eat Free at Perkins Restaurant? What day do kids eat free? Varies by location. 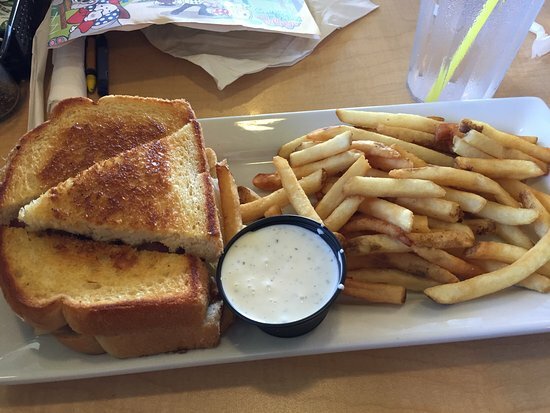 Summary: There are several external sources that list kids eat free discounts at Perkins. Please contact your local restaurant (Perkins locations) and ask if they participate and if so, what the details of the program are. Does Perkins Restaurant Offer Military Discounts? What Does Perkins Restaurant offer for My Birthday!? Be the first to know about our promotions and get exclusive offers starting with a 20% off coupon just for joining and a special gift for your birthday. Add your family members ages 12 and under so they can get birthday gifts too! The birthday emails will be sent to your email address. Does Perkins Restaurant Offer First Responder Discounts? Does Perkins Restaurant Offer Senior Citizen | AARP Discounts? Summary: There are several external sources that reference senior citizen discounts at the restaurant chain. Please contact your local restaurant (Perkins locations) and ask if they participate and if so, what the details of the senior citizen or AARP discounts are. Are There Any Other Discounts or Benefits at Perkins Restaurant? Summary: The chain offers its MYPERKINS Loyalty Program which provides several ongoing benefits. Check their page for current information and promotions. Also, make sure and check out our Rewards Program Page for links to all restaurants featured on Back of the Menu. Vegetarian | Vegan Options: No resources found. Dairy Free Options: No resources found, but the following may be helpful to you. Does Perkins Restaurant Have Any Secret Recipes? Perkins does not have any mobile apps at this time. Matthew Perkins and his brother Ivan went looking for gold in Alaska but found it in Seattle. Their business plan was simple in that they saw something that worked very well in Smitty’s and brought it to the other side of the country and created their own success story. Individuals or businesses not reinventing the wheel probably happens more than we realize (Walmart and Tom’s Shoes are good examples) where a company starts based merely on the fact that an entrepreneur sees something working so well for others (in the case of Smitty’s people were lined up out the door) and adapted their version. I like the fact that Matthew seemed to do this in a very ethical manner in working out a business plan with William “Smitty” Smith and sticking to that. I’ve never been to a Perkins restaurant before but as so often the case, I’m not drawn to visit at least once to take a walk down memory lane and think of the story of Matthew and Ivan and the story that began over 60 years ago. Who doesn’t like a good story?